A line of EtherCAT modules with open loop step motor drives that are specifically designed to address the needs for economical solutions for machines with many open loop step motors operating as part of an EtherCAT network. 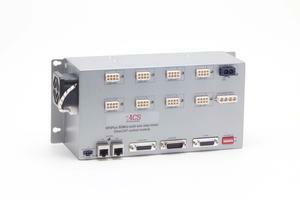 It is available in 4 and 8 axis versions, with or without built-in motor power supply. Each unit includes one bipolar drive with up to 40Vdc, 3A. All other drives are unipolar with up to 40Vdc, 3A. The current level is individually programmable for each drive and can be set to the following levels: 1A, 1.5A, 2A and 3A. The step resolution is individually programmable for each drive and can be set to the following levels: full step, 1/2, 1/4, 1/8 and 1/16 step. The SDMnt includes two sets of Pulse/Dir inputs and two sets of Pulse/Dir outputs for Master-Slave operation. There are 6 general-purpose inputs and 6 general purpose outputs. Modules with 40Vdc, 240W built-in motor supply are fed by 95Vac to 240Vac. The 40Vdc is also available as an output to power additional units. Modules without built-in motor supply are fed by a 12Vdc to 40Vdc input. The unit is also fed with a 24Vdc logic supply that keeps logic signals and communication alive.The unit is also fed with a 24Vdc logic supply that should not be removed during emergency conditions, thus keeping the logic and communication alive.